Text: Besides taking me to Woolworths, she [her aunt Rose] sometimes took me to the pictures, and what a thrill that was. I had only been with the penny rush before that. The penny rush was held on a Saturday afternoon in a cinema just off Roman Road, and it was just what its name implied. My cousins made it a regular Saturday treat, and Eva often went along with them, but none of them liked taking me. As we hurried along, clutching our orange or bag of peanuts, they would talk between them of Norma and Richard Talmadge and lots of other stars, but all I did was to pray like mad that no one would kill anyone or fire any guns. When the doors opened we all rushed in, and for some reason that I could never fathom at the time, they all made for the seats near the back and only the late comers sat in the front rows. As soon as the film started, the piano would start to play, the pianist dressed in a long black skirt with a white fancy thing on her head a bit like a Lyons nippy. As soon as things got going, the piano would play loud banging music and I’d grip my hands on the seat and shut my eyes tight. Just in case anyone fell down dead. When a car came towards me on the screen, I was dead scared in case it came right out and ran me over, and when the cowboys and horses galloped in my direction, I would shoot under the seat and stay there. If however the picture was sad, I would burst into tears and have to be taken outside in disgrace for making a noise. Mum and Dad once took us to see Charlie Chaplin in ‘The Gold Rush’ as a very special treat, but I broke my heart over the poor little man having to stew his boots for food. “Oh, please, please,” I cried, “please can’t anyone give him some food?” So, all in all, no one was very keen on taking me to the pictures. But when I grew a bit older and learnt to control my emotions, nothing delighted me more than being taken to the pictures by aunt Rose. Even the cinema she frequented as different, it didn’t smell of smoke and oranges and sweat; there was a smartly dressed young lady who walked around spraying something into the air, and it smelt more like the perfume department of a big store. The pictures we saw were nicer too: we never saw cowboys and Indians there, but there were ladies and gentlemen kissing each other and holding hands and getting married and riding in lovely carriages. Or else they were dying gently in big beautiful beds, even better than aunt Kate’s. “Kiss me Charles, and be good to baby,” would flash on the screen, and the audience in aunt’s type of cinema would read quietly, and just sob gently, if it was very sad. I would keep putting out my tongue to catch the tears as they rolled down my cheek, lest aunt should see me crying and not take me again. The piano played soft haunting music that made you want to keep on swallowing hard, and when you eventually came out into the bright sunshine, you could pretend you had something in your eye and keep on wiping it. But aunt had developed a sudden cold too, and had to keep on sniffing, so we’d sniff and wipe our way home, where the two dogs would give us a boisterous welcome and aunt would make tea, talking all the time about what she’d have done, had she been the heroine. “She was too soft with him, don’t you think, Dol,” she would call from the kitchen and, thrilled to be talked to as an equal, I would discuss with her the merits of the film. At the penny rush, everyone read the captions out loud. “Oh leave me sir,” we would all call out, as the maiden struggled with the villain. Oh, we had incentives to become fast readers in those days. Perhaps today’s children would become better readers if the T.V. went back to the old silent days for its stories and children had to use their brain to read, instead of being spoon fed with all their entertainment. Everyone was singing ‘Climb upon my knee, Sonny boy,’ and aunt Kate set off in joyful expectancy. What a scene they had with her when she came home! She cried and cried all night, and half the next day too, standing at the corner and wiping her eyes on her apron, the tears making rivulets sown her powdered face. 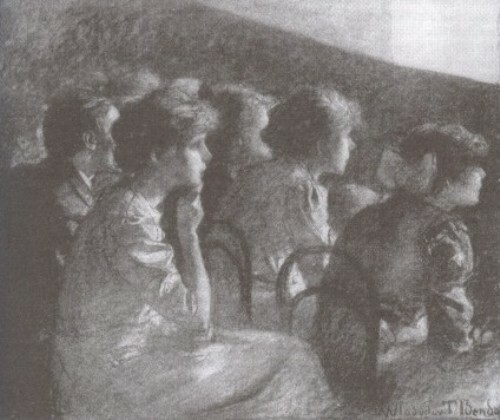 ‘When aunt Kate went to the pictures’ became a talking point all through the family for weeks after that. Comments: Doris M. Bailey (1916-? ), daughter of a french polisher, was born in Bethnal Green in London’s East End and lived there until the late 1930s. Norma and Richard Talmadge were not related. The films referred to are The Gold Rush (USA 1925) and The Singing Fool (USA 1928). This entry was posted in 1920s, Memoirs, United Kingdom and tagged Children, Cinemas, Crying, Doris M. Bailey, First impressions, Food and drink, Hygiene, Intertitles, London, Matinees, Music, Musicians, Performers, Reading intertitles, Seating, Smells, The Gold Rush (1925), The Singing Fool (1928), Westerns. Bookmark the permalink.